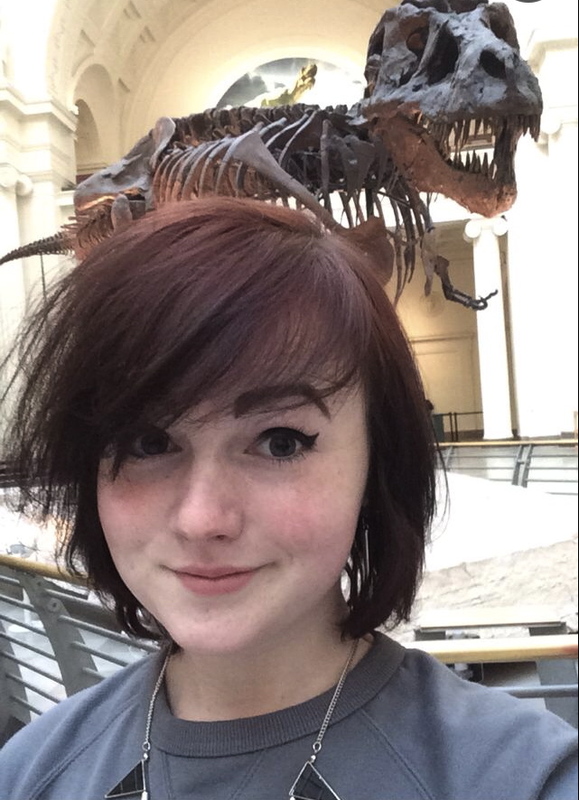 Today was my last day at the museum, and was, except for an afternoon adventure which I will later detail, a very normal day, which opened with (finally) my obligatory selfie with Sue. For those of you who don’t know, Sue is the resident T. Rex, and is kind of a big deal because she’s the largest, most complete, and best preserved T. Rex fossil in the world. Anyway, I walk in every morning and try to break through the throng of Sue selfie (Suelfie? )-takers to get to the paleo office. On day one I thought the craze was a little stupid. By the middle of the second week, I thought it was a bit cute. I woke up on my last day with an urgent need for a Suelfie. Following that, I spent my morning struggling to reassemble an enormous and completely shattered brontothere tibia. We broke at noon for a much-needed cheeseburger break, and somehow got onto the subject of bug phobias. I mentioned that I’d never had a problem with spiders (put a wasp anywhere in my line of sight and I will scream like a four-year-old watching Saw II, but that’s another story). 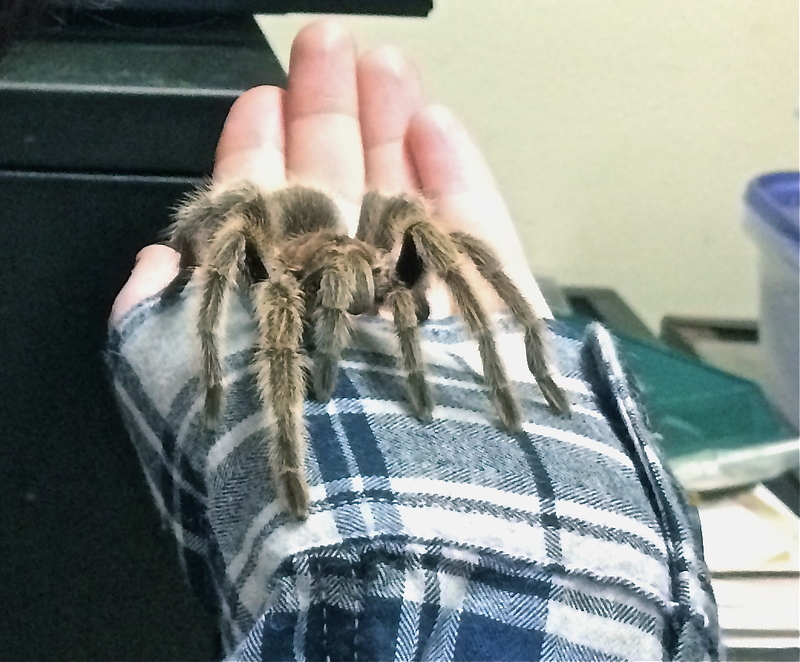 “A tarantula,” explained my manager. 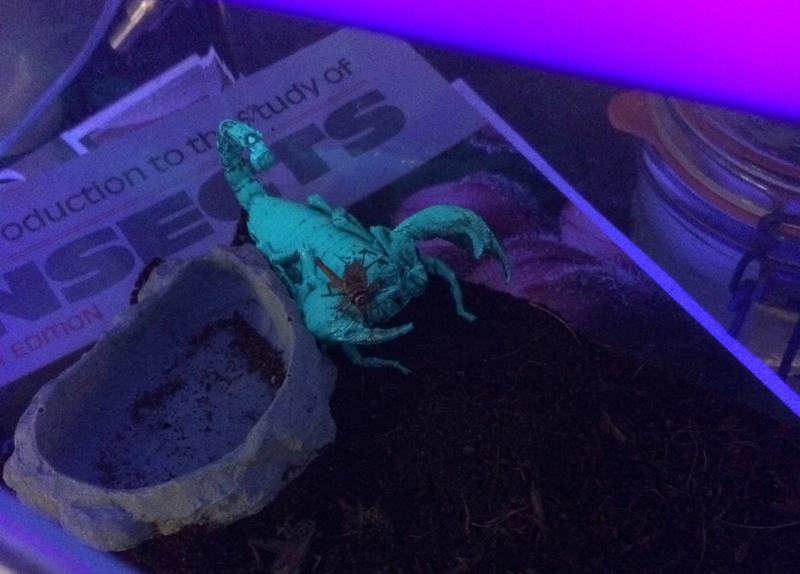 …and I learned that scorpions would have a great time at an EDM festival. Confused? That left us with about three hours to work on the tibia again before we said our goodbyes and I took my last slightly shady, gospel-music-blaring taxi ride back to Ogilvie Station. …but I did get to attempt to fix about half of a rib and the lower quarter or so of a femur, which was cool. 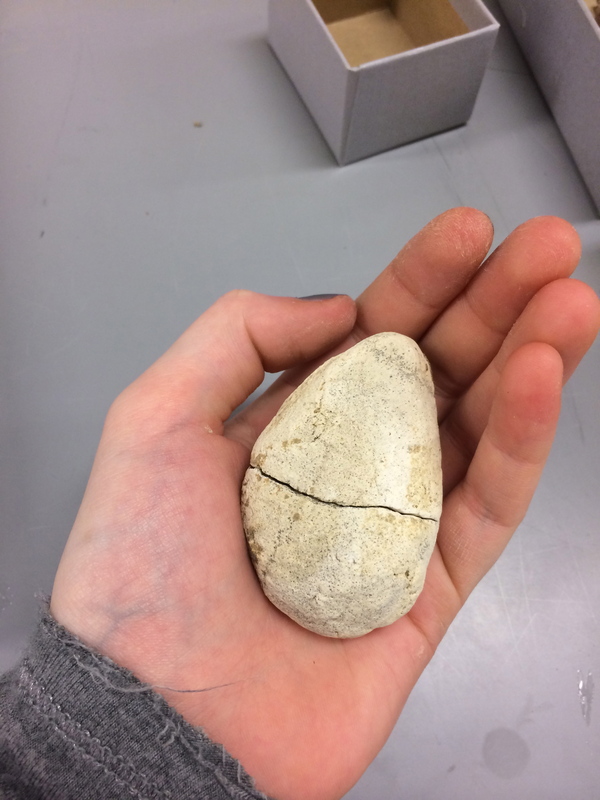 We also found what we thought may have been an egg until my manager informed me that it was a coprolite which added a little, uh, excitement to the morning. We spent the entire afternoon on Friday and today cleaning this massive pelvis. 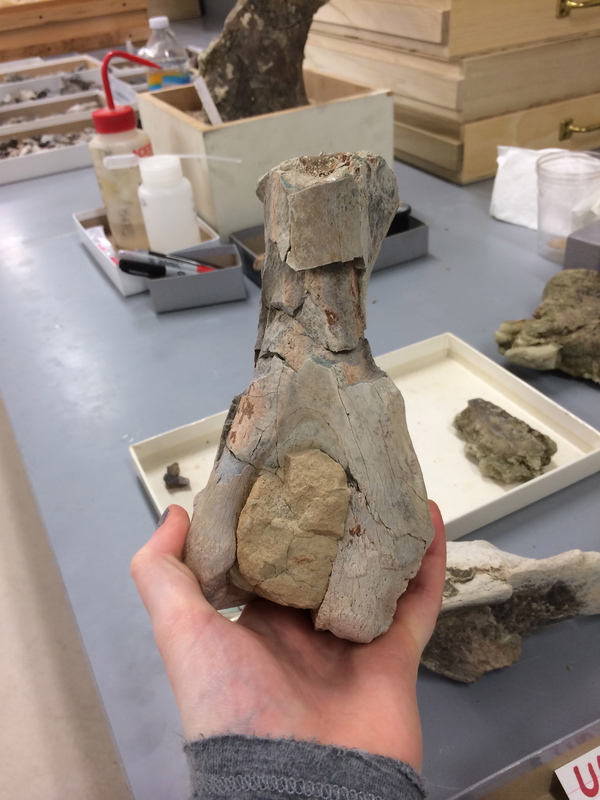 It hasn’t been identified yet, but my manager seems pretty sure that it’s a brontothere, which is a mammal from the Eocene that looks quite a bit like a modern rhino despite being a much closer relative of a horse. We’ve had a lot of scattered pieces of brontothere teeth, ribs, and even a few reasonably intact leg bones, so it’s definitely a possibility. 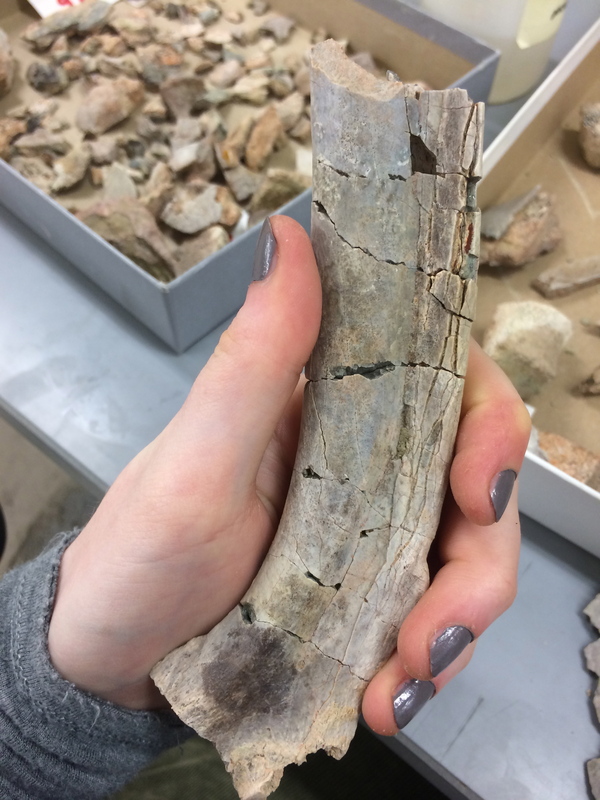 I talked about cleaning fossils in my last post, but apparently that sort of cleaning is reserved for the weaker bones. In this case, you wash it as usual in the big industrial sink, but for bigger, sturdier fossils, especially ones that are as caked in mud and sandstone as this one was, that’s only step one. While the matrix around it is still wet, you scrape off everything you can with a dental pick, and then let it dry overnight (or, in this case, over the weekend). 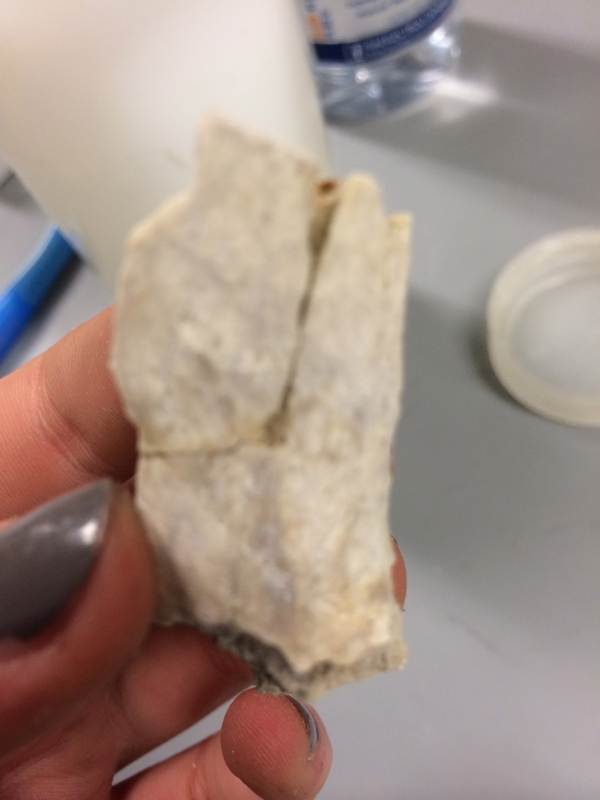 Then you squirt it with acetone to dissolve any glue that might have been sprayed on it on-site to keep the fossil in one piece. Returning to the museum after a weekend downtown with some of my friends made for a definite change of pace and sleep schedule, but today and Monday still managed to keep me on my toes. 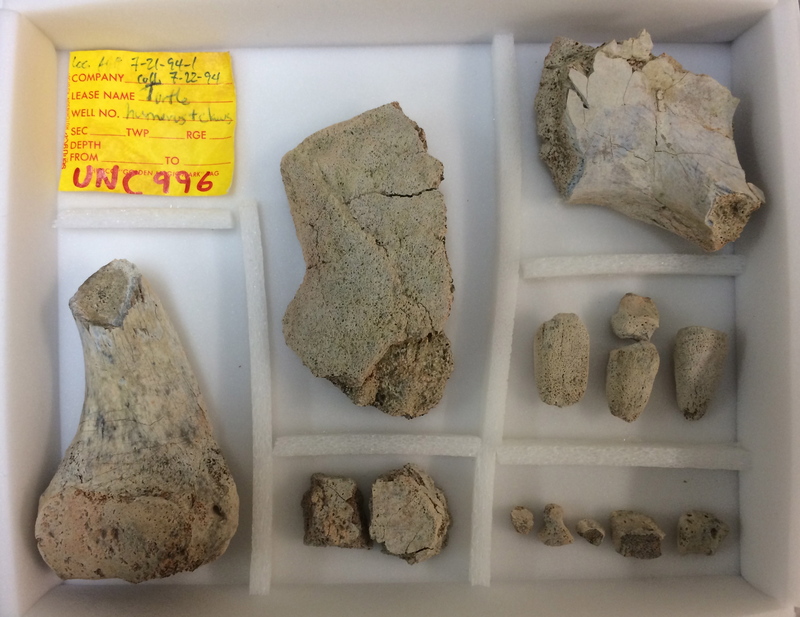 Yesterday was spent dealing with several boxes of small mammalian carnivore fossils that had been found but unprocessed in the mid-nineties. There were a few skulls in startlingly good condition, but for the most part we had a lot of repair work to do. So, that looks like my week. Fun fact: getting those two pieces consolidated took most of my morning, or at least what of it I spent actually working. That wasn’t all that much time, though, since tomorrow will be opening day for a new temporary exhibit on biomechanics. Definitely a very different scene than fossils, but one that’s also very cool. We spent our lunch break at a staff-only lecture with the curator, after which my manager gave me and the other intern an hour off to go through it before it opened to the public. The exhibit operated under less of an assumption that we knew anything about biomechanics than the lecture, which was good, since my understanding of that field is very low, but they were both really interesting. 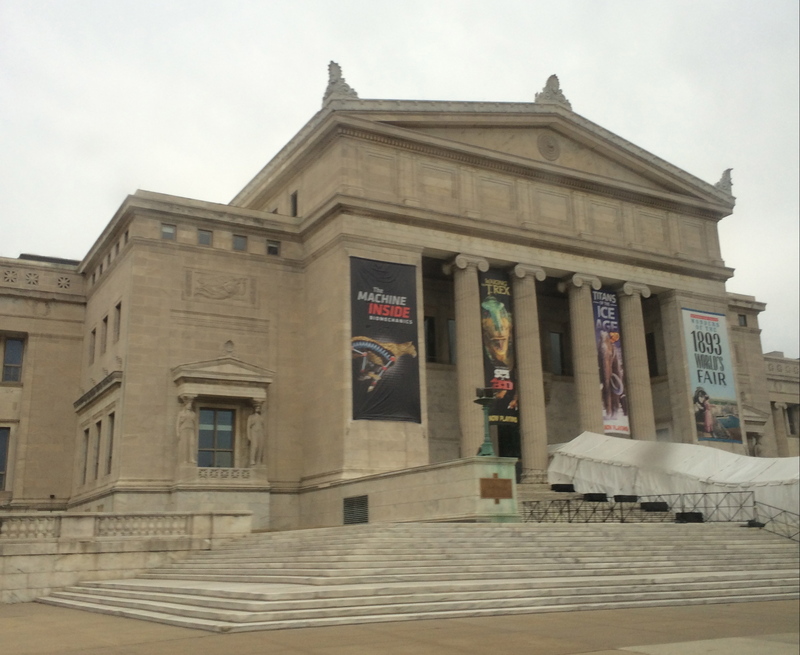 Tonight is the much-anticipated weekly Members’ Night at the Field Museum! What that entails is the museum staying open late so that members can tour the usually behind-the-scenes parts. I think there may also be free food involved, but I’m not sure on that one. 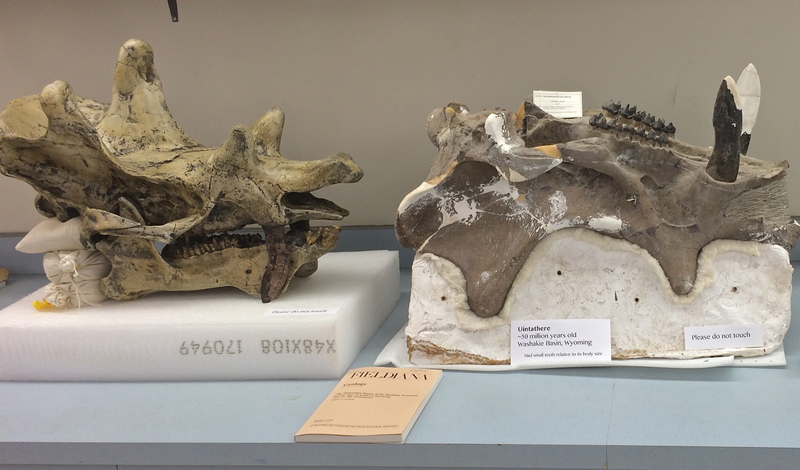 …as well as a few other things showing steps in the fossil prep process, including an example display assembled by your humble narrator! I couldn’t stay late enough to be at the event itself, but having one of my displays shown was definitely the highlight of my day. The last couple days have been a bit crazy. Now that my newbie training’s over, I’ve still been doing a lot of cataloging and numbering and making displays, but I’ve also been washing and repairing fossils which is super rad and much more hands-on. Basically, when fossils come in, they’re not the neat little (or huge) bones that you see behind glass. They’re almost always in these weird plaster bags that are full of dried mud and rocks (and maybe a tooth somewhere in there). You have to put this chunk of stuff in a sieve and run water over it. Most of the silt comes off pretty quickly, and as it goes from one big thing to a lot of little things, you have to decrease the water pressure so as not to damage anything. 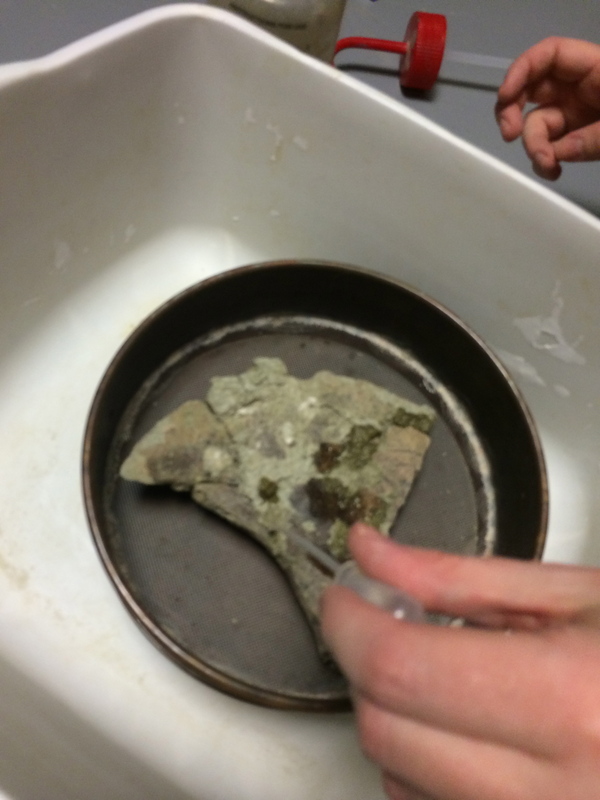 Eventually you wind up with a sieve full of rocks and fossil bits, which you have to separate, and then the fossils get another rinse before being set out to dry. It beats dinner wash any day. Repair, which was actually the part of my internship I was most excited about, is a total pain in the you-know-what. 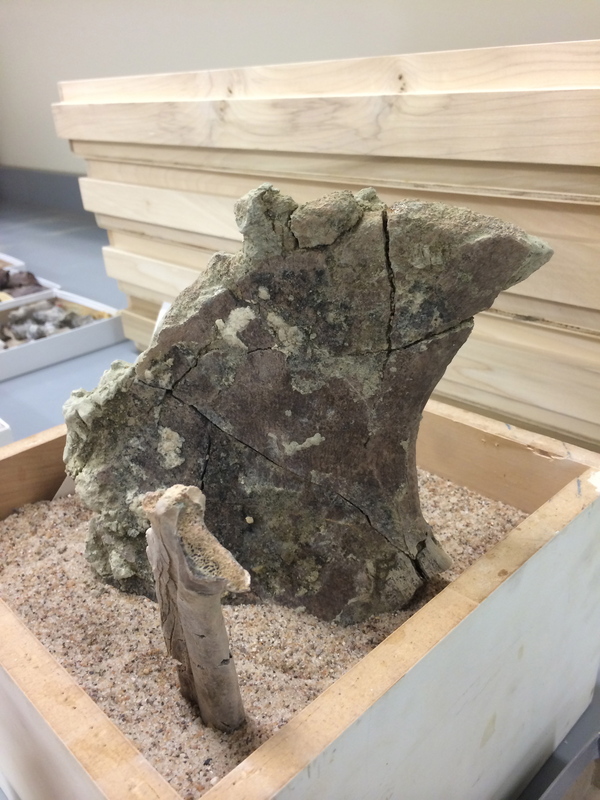 After all the bone bits are clean and dry, they get organized into boxes by site and then you have to repair them. This translates to: sit and stare at a box of bits of things and try to figure out how they fit together, if they were even from the same animal to begin with. It’s like the most frustrating jigsaw puzzle ever, except there are three different puzzles mixed together and half of the pieces are missing and there’s no picture on the front of the box. If the three of us working down there can get more than five or six matches in a day, it’s pretty successful. We got a whole rib (about two feet long) pretty successfully fixed up on Wednesday, and my manager bought everyone lunch. It looked promising, to say the least. Full disclosure; I abandoned all pretenses of maturity and was grinning like an idiot and looking around at femurs twice my height so fast that I think I may have given myself mild whiplash. Of course, I wasn’t put in charge of anything that important on my first day. For now I’m labeling a new shipment of fossils and making and organizing display trays, which is actually sort of fun if you’re the type of person who gets very excited about hot glue and Xacto knives. These are my very scientific supplies. Basically, what you do to make a display tray is you take a piece of styrofoam and a template and cut it out. There are approximately 11,000 sizes of templates (probably closer to 15, but math has never been my forte) so you have to do a bit of eyeballing to figure out the size you’ll need. Then, you cut off a square inch from each corner, take an appropriately sized box, and squish the styrofoam in as a lining. So, yeah. Welcome to paleontology time, where sixty million years is barely vintage. 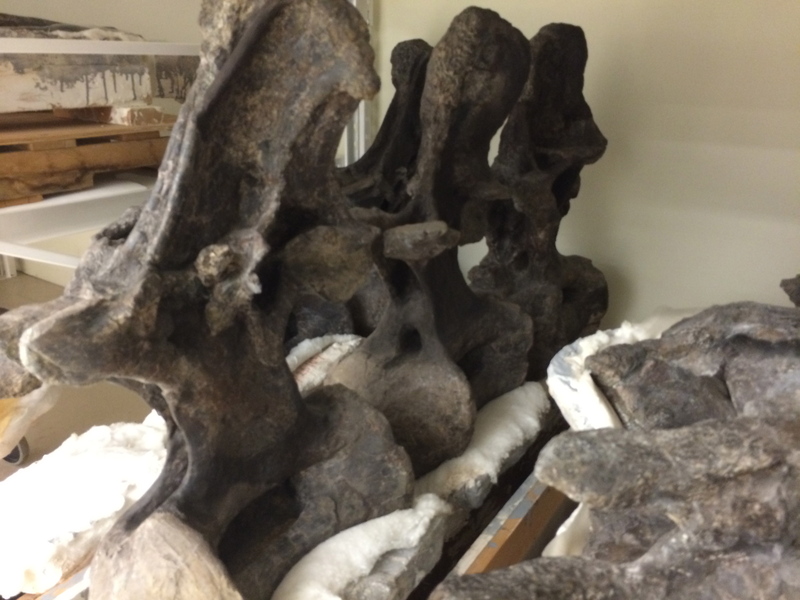 We would be glad to take on an intern in our vertebrate paleontology department. Please reply if that suits you. 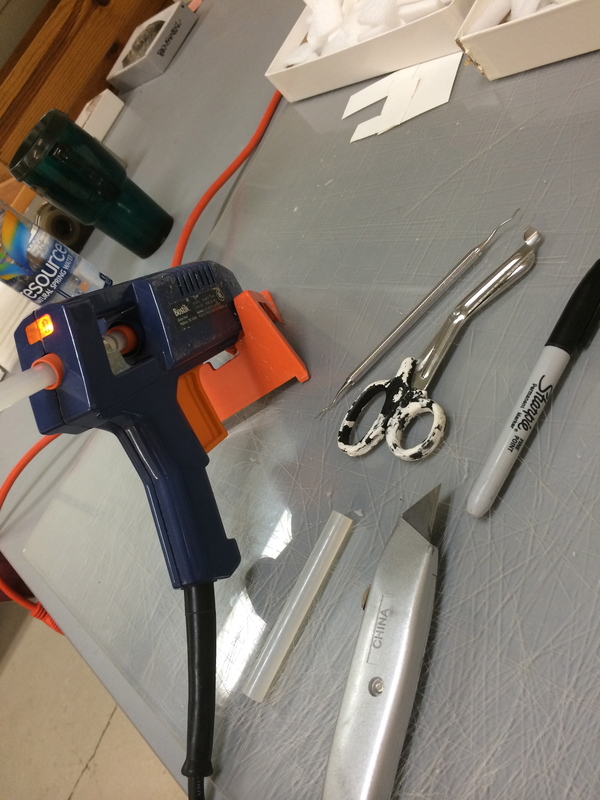 What does a vertebrate paleontology internship entail, you might ask? Well, first off, it’s a chance for my four and a half years of Latin to prove relevant in life. Mostly I’ll be cataloguing, sorting, and repairing new fossils (I guess that’s a bit of an oxymoron) as they come in. Depending on how quickly I learn to rattle off dinosaur names and fun facts, I might be giving tours as well. Ironically, I’m much more excited for this somewhat thrown-together project than for my original plan (which is a whole ‘nother hot mess of a story). I’ll post again once I fly out next Saturday!